An inviting nostalgia permeates this collection of newspapers columns based upon the author’s experiences growing up on an Iowa farm more than 50 years ago. 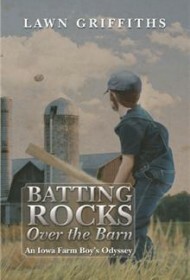 The title alone will resonate with anyone who ever grabbed a flat stick and a handful of rocks and sent those rocks humming over a rooftop for imaginary game-winning home runs. For eight years in the 1970s, Lawn Griffiths, then farm editor at the Waterloo Daily Courier in Northeast Iowa, penned 400 “Rural at Random” columns. Here, he assembles more than 70 of them to present an affecting, almost historical, portrait of farming. With 20 milking cows, hogs, and 1,500 hens to help look after, Griffiths, his twin brother and a sister were kept busy with a demanding schedule of daily chores before and after school. But as Griffiths tells these lyrical essays, he still manages to evoke a sense of long, languid Midwest days when life was much slower-paced than today. Other entries focus on wonderfully obscure topics that many readers have never considered: gates and fences, tractor seats, the mysterious contents of toolboxes, precious farm flashlights, and more. He also writes wistfully about the tiny country school — “Education at the edge of a cornfield” — the death of the local blacksmith and dozens of other intriguing subjects. This book will charm readers of a certain age—perhaps those upwards of 50—especially if they shared a similar rural childhood; many others will equally enjoy these well-crafted recollections from a bygone era.